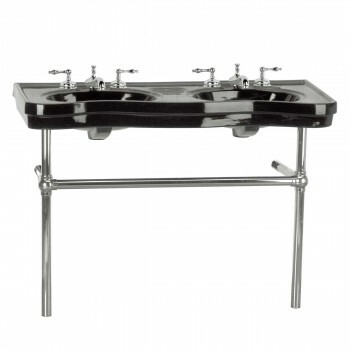 Belle Epoque DOUBLE Deluxe Bistro sink 33 1/2 in. H x 46 3/4 in. W x 19 1/4 in. proj. Captures the elegance of the Belle Epoque period. Spacious countertop with HIS and HERS basin, self-draining soap dishes, protective splashguard rim. Chrome-plated brass frame and handy integral towel bar. Grade A vitreous china construction with a SCRATCH & STAIN resistant RENO-GLOSS finish. Accepts two 8 in. widespread faucets sold separately. 33 1/2 in. H x 46 3/4 in. W.